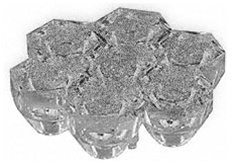 The Polymer Optics 7 Cell Cluster 12° diffused optic array is designed to mix and broadcast the output of 7 Rebel LEDs into a narrowly focused output beam. Polymer Optics Cluster Opticarrays can be assembled together in a number of ways to meet the needs of a range of illumination applications. This diffused version of the 12° optic offers a smoother, more evenly distributed beam of light over the non-diffused version.